Three day pork-a-thon: Wine & Swine Culinary Weekend. 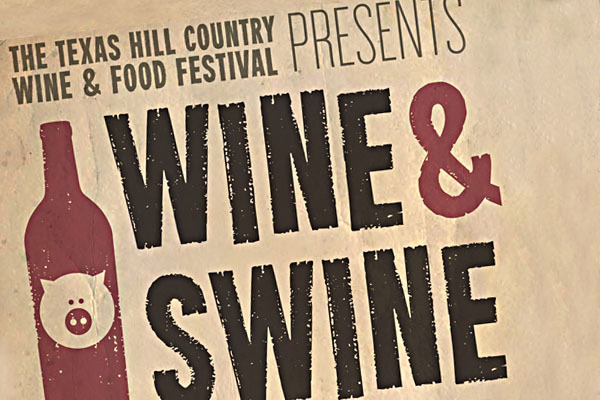 The Texas Hill Country Wine & Food Festival is presenting smaller events, throughout the year, to highlight local chefs, artisan producers and winemakers leading up to the annual Texas Hill Country Wine & Food Festival, scheduled for March 31 – April 3, 2011. This coming weekend, they have three events. Friday: Pork & Cork walk-around tasting at the AT&T Conference Center courtyard. Saturday: Wine & Swine parings at the Carillon. Sunday: Texas Hill Country Pig Roast in Driftwood. I got two tickets to giveaway for Sundays Pig Roast, Dec. 5, 12 – 4 p.m. Participating chefs include: Jason Dady, Jason Dady Restaurant Group, (San Antonio); Jonathan Gelman, Driskill Grill; Jack Gilmore, Jack Allen’s, Kitchen; Lawrence Kocurek, Kocurek Family Charcuterie; Larry McGuire, Perla’s Seafood & Oyster Bar & Lamberts Downtown Barbecue; Josh Watkins, The Carillon; John Bullington of Alamo Drafthouse, Paul Qui of uchiko, Rebecca Rather of Rather Sweet Bakery (Fredricksburg) and La Condesa. Entries accepted starting today through noon Thursday, Dec 2nd., 2010. I’ll use www.random.org to select the winner. Only one entry per person. As usual, void where prohibited, blah, blah, blah (insert legal mumbo jumbo here). Your email address will remain private. I just need it to find you when you win. nevermind – just realized it’s already over! Did you go? Paul Qui was not there check it out on my blog. I stopped in at the Friday night event at the ATT Center. Good eats.